Like us, you believe that history matters. That people appreciate history through the telling of good stories. That our past inspires us, gives meaning to our lives, informs our decisions and is critical to our future. Thank you for your interest in the exciting plans for a new Wisconsin History Museum – a 21st-century museum that will share history like nothing that exists today. Since 1846, the Wisconsin Historical Society has been Wisconsin’s place for history and one of the world’s most respected historical institutions. Limitations of our current museum — located in a former hardware store on Wisconsin’s Capitol Square — prevent us from properly sharing and displaying our state’s stories and world-renowned collections. 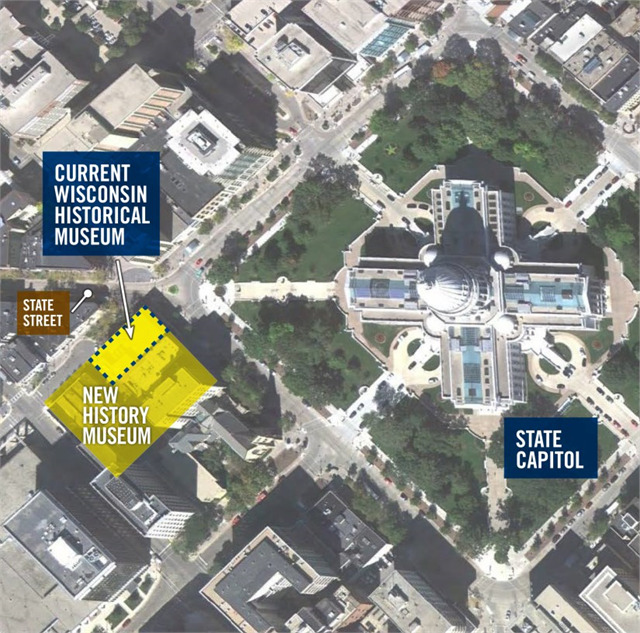 The idea of a new history museum has existed for nearly two decades, with support and planning by Governors Tommy Thompson, Jim Doyle and Scott Walker. Thanks to a public-private partnership, now is the time to seize this long-awaited opportunity to transform how history is shared in Wisconsin. The museum footprint will expand to 100,000 gross square feet, and is estimated to cost $120 million. The State of Wisconsin has committed $70 million to the project if the Society raises $50 million in private donations. WITH YOUR HELP THE NEW MUSEUM WILL . . . If you would like to be the first to know about exciting developments with the new museum project, become a member of the Wisconsin Historical Society today! To ask a general question about the new museum project, send an email to newmuseum@wisconsinhistory.org. The next chapter of our state’s history is being written, and the Wisconsin Historical Society has a rare opportunity to deliver an unforgettable modern history museum to celebrate and honor Wisconsin. To make a new museum a reality, we need you now. If you want to learn more about why this extraordinary project will transform how history is gathered, shared and experienced across Wisconsin for the next century, contact Julie Lussier, Wisconsin Historical Foundation Director of Development, at 608.261.9587 or julie.lussier@wisconsinhistory.org.